No Skidding® offers three styles of Die Cut Cleats: No Legend, "Caution" or "Watch Your Step". The No Legend Die Cut Cleats come in four materials: Anti Slip Grit Tape, Anti Slip Grit Tape with Reflective Stripe, or Anti Slip Grit Tape with Glow-in-the-Dark Stripe, or Anti Slip Resilient. Reflective and Glow-in-the Dark stripes provide an extra level of safety during blackouts, at night, or in low light conditions. Caution or Watch Your Step legend signal visual warnings. Anti-skid tape provides traction on slippery or slick floors. Installation is simple. Merely peel off protective release liner and press in position. Our Grit Strips and Cleats are manufactured to ensure an OSHA compliant environment. They are manufactured from a cross-linked polyolefin, more durable than conventional PVC vinyl and are imbedded with an aggressive grit that won't wear down and round off as rapidly as competitors' products. No Skidding® Resilient is tough enough to use where other grit anti-slip tapes are used, but is gentler to the touch making it ideal for clean rooms, laboratory and food processing facilities. Our strips and cleats are long lasting and chemical resistant products used around the world in applications requiring a consistent, reliable quality anti slip product. Anti Slip Black Die Cut Strips are an excellent and economical choice for most general purpose commercial and industrial indoor and outdoor requirements for slip resistant strips and cleats. Certified High Traction by NFSI. Anti-Slip Resilient Tape. A softer, resilient, rubberized anti slip tape. It is engineered from a unique rubberized material that is comfortable enough for bare foot traffic, yet tough enough to withstand heavy boot, shoe, or cart traffic. Suitable for industrial areas, ramps, dock areas, boat decks, walkways, stairwells, work areas, machine shops, industrial equipment, trucks & trailers, and hundreds of OEM applications. A long lasting and chemical resistant product used around the world in OEM applications requiring a consistent, reliable excellent quality anti slip product. 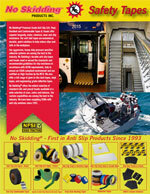 NS5200 Anti-Slip, High Traction Safety Tape for long lasting tough applications. Anti-Slip High Traction Safety Cleats Grit NS5100 - 6" X 24" $3.60 to $3.00, based on quantity - full range of colors. Anti Slip Die Cut Cleats, available in a full range of colors are an excellent and economical choice for most general purpose indoor and outdoor requirements for slip resistant strips and cleats. Minimum order 5 pieces. NFSI Certified as High Traction. This product is made from a durable 60 grit aluminum oxide formulation that results in a durable and reliable result and is die cut in convenient 9"X33" pieces. Anti-Slip High Traction Safety Clear Grit NS5100C - 6" X 24" - $3.76 per piece. Anti-Slip Clear Grit Clear Die Cut Cleats are an excellent and economical choice for most general purpose indoor and outdoor requirements for slip-resistant strips and cleats. NFSI Certified as High Traction. Indoor application only. Priced per strip but sold in multiples of 8 strips. Minimum order is 24 strips. Each strip measures 0.75 inch by 17.5 inches and is clear. 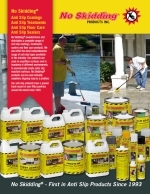 Provide a clear "Caution" message to workers and also provide an anti-skid surface to alert for your hazardous areas. Easy to install. 6"X24"
Priced per strip but supplied in multiples of 100 strips. Each strip measures 0.75 inch by 7.5 inches and is clear. Indoor application. Priced per strip but supplied in multiples of 8. Minimum order 24 strips. Each strip measures 0.75 inch by 17.5 inches and is clear. Easy peel & stick installation. Priced per strip but supplied in multiples of 12 strips. Each strip measures 0.75 inch by 7.5 inches and is white. Long lasting for tough applications. Suitable for industrial areas, loading ramps, dock areas, walkways, stairwells, work areas, machine shops, industrial equipment, trucks & trailers, and hundreds of OEM applications. NFSI Certified. Our premium high traction series that helps to ensure an OSHA compliant environment but die cut in convenient 6"X24" pieces. Certified High Traction by the NFSI. Minimum order 5 pieces. Premium high traction series that helps to ensure an OSHA compliant environment but die cut in convenient 6"X24" pieces. Includes an added photoluminescent glow stripe on each piece. Minimum order 5 pieces. NFSI Certified. Premium high traction cleat that helps to ensure an OSHA compliant environment but die cut in convenient 6"X24" pieces. Minimum order 5 pieces. Includes an added reflective stripe on each piece. NFSI Certified as High Traction. Suitable for industrial areas, ramps, dock areas, boat decks, walkways, stairwells, work areas, machine shops, industrial equipment, trucks & trailers, and hundreds of OEM applications. NFSI Certified as High Traction. Provide a clear "Watch Your Step" message to workers and also provide an anti-skid surface for your hazardous areas. Easy to install. This product is part of our premium high traction series that helps to ensure an OSHA compliant environment but die cut in convenient 3/4" X 24" pieces.